Let’s imagine a super luxurious spa day. Picture it: cucumber water. Fluffy robes. Enya. Now, imagine exiting the spa and driving directly to a tax appointment, to be followed by dinner with your passive aggressive cousin. But CLEARLY you wouldn’t do that, right? No sane human would ‘undo’ six hours of happiness and self-care like that, would they? My dudes, we all do this ish all the time. We check email while we’re on vacation. We make mental to-do lists while friends tell hilarious stories. We start doing the dishes in the middle of the party we looked forward to hosting <- real thing I do because I’m Super Fun. This is so, so self-defeating and joy-sabotaging. In the pie chart of our lives, joy is a pretty small slice. Much of our lives consist of boring, responsible, logistical things. The shining moments of joy – a great conversation, a long-awaited holiday, amazing food – are the minority. And yet! So many of us crowd those few happy moments with stuffed schedules and mental to-do lists. In fact, studies show that a significant amount of happiness comes from anticipating something we enjoy and a significant amount comes from recalling it. We’re literally sucking joy out of our lives by cramming our schedules and minds so full. We deserve better than that. Our lives and minds and relationships deserve better than that. And it’s not hard to do better! If it’s possible, don’t cram things in before and after your happiness-inducing stuff. It’s hard to get excited about your dance class if you’re heading there right after work and then taking a conference call immediately afterward. It’s hard to get into Vacation Mode if you’re working on spreadsheets at the airport. Give your happiness some space to breathe, dude. Even if it’s just thirty minutes to calm down and transition out of Work Mode, your happiness deserves your attention and time. In a moment of joy, I say to myself “Be happy in this moment. This moment is your life.” Yes, I know it’s cheesier than a pile of cheddar BUT IT WORKS. Check out out your travel destination on TripAdvisor, Atlas Obscura, and Roadtrippers. Search related hashtags on Instagram. Read a novel or watch a movie related to the band you’re seeing, the city you’re visiting, or the mountain range you’re hiking. Later this month, Kenny and I are spending a long weekend in Decorah, Iowa and I’m stretching out that happiness by reading The Bridges Of Madison County and The Thunderbolt Kid. When we devote more brain space to our happy-making thing we can squeeze more happiness out of it. On the way back from your trip, work on a list of 100 memories together. When you’re catching up with friends, share the highlights of your happy-making endeavors. Take photos or videos of the concert/party/game night/vacation. Grab a business card from the amazing cafe and put it on the fridge. You get the idea! Create a breadcrumb trail of memories and mementos that lead you back to happy things. My vices are a) planning a future trip while currently on a trip b) cleaning up the party while my friends are still there. Maybe you’re someone who checks email while you’re on vacation. Maybe you over schedule yourself or picks fights during situations that should be relaxing. We all have different ways of crowding out happiness, but if we notice what we’re doing, we can change our behavior. But I want to hear from you! 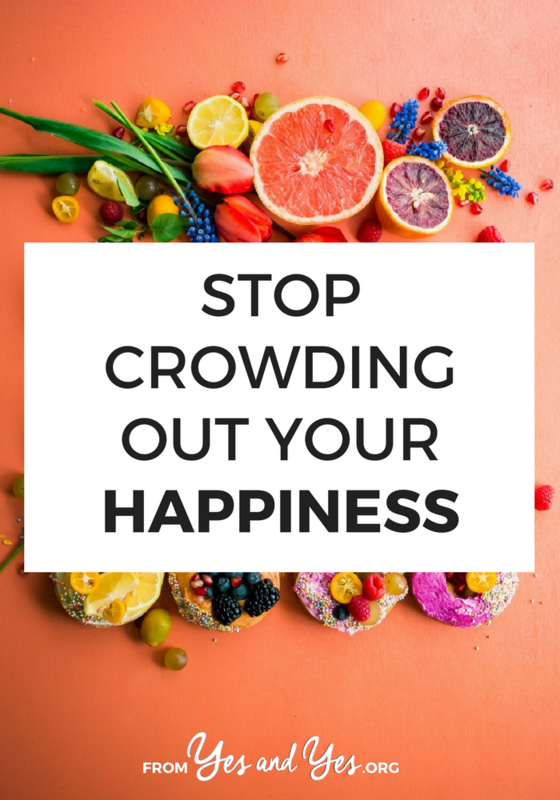 Do you have any happiness-crowding habits? How do you extend your happiness? I just got back from my best friend’s destination wedding and this advice could not have come at a better time. I definitely need to sit with the happy. Also, I love the idea of walking through your senses. Somebody gave me that advice for my wedding day and it was such a great exercise in slowing down and taking it all in….why, oh why, have I not thought to apply the practice to other happiness-inducing activities!? Duh! P.S. Decorah is the MOST adorable. I always do what you do… clean up while my friends are still there. It’s like I can’t relax unless everything’s tidy, but where’s the joy in that? OMG, that’s so me!!! When I’m out at a party or nice restaurant, or on a day trip, I usually start thinking about how I’ll get home. Like: should I take a cab or the tube? Will the highway be crowded?! When I’m on vacation, I think about how I’ll get to the airport and when! It’s so stupid and more so, I drive my husband nuts doing this. 😉 I try to get better and stay focused on the present moment, but I slip every now and then. And the weird thing: sometimes it even relaxes me going over it in my head! Ugh the thing about cleaning up at parties nearly made me cry, I can’t really pinpoint why. Because it resonates, I guess! I have an anxiety monkey on my back most of the time. The anxiety monkey has me worried and fretting and planning for all the things that haven’t happened yet and worried, fretting and reliving all the things that have already happened and can’t be changed. But with age comes some small amount of wisdom and an ability to ditch the anxiety monkey every so often. Daughter’s wedding was in March. I spent December to March in a state of total stress. Day of the wedding I was stressed up until the moment I walked into the church and somehow managed to leave the anxiety monkey outside the church doors. And I neglected to pick up on the way out! At the reception I did all of the mother of the bride meeting and greeting stuff but let the maid of honor take care of the rest. As my husband said “Honey, that’s her job!”. I laughed and danced and watched my daughter laughing and dancing as well as my son-in-law and husband and son and friends and family…. I let myself be in the moment and savor it. I’m learning. You can’t savor the present moment if you’re spending it projecting yourself into a future moment that hasn’t arrived yet. This is such an important piece! We are all guilty of this to a greater or lesser extent. When you have a strong ‘task driven’ mentality, it’s hard to ignore the chores on your mental ‘to do’ list. Equally, how many of us see a job and get on with it – even if it’s a moment when you could be happiness-making? I recently wrote a post on ‘being present’; it’s a work in progress. This is a perfect piece for a society that is always busy doing/planning/talking about the next thing! I love the advice about the stopping and noticing all 5 senses. Keeps you grounded and present. This past weekend, I got 22 hours with my close friend who is long distance. It was amazing and very needed. We caught up on mundane life stories, people watched and didn’t once talk about next adventures. I just enjoyed being there with her and her BF. Nothing else mattered much at that point. Great article! Such a great post! I recently went a trip to a place I used to live. I LOVED living there and the minute the plane landed, I felt terribly sad. I was already dreading leaving even though I had 5 days of fun plans ahead. My wise husband encouraged me to change my perspective from “I miss this and I don’t have this now” to one of gratitude. It helped! When we were headed back home I was sad, but I actually enjoyed the trip and really felt like I was in the moment rather than thinking about the past or feeling anxiety about the future. In some ways, I also felt like I grew out of the place. Sure, I’d still live there again, but I have changed and the place has changed. I can’t re-live the life I had, even if I were to move back. Ever since college, I’ve been one to wait until the party was over to clean up. I highly recommend it! I am so guilty of missing out on fully enjoying the fun moments. My birthday is Friday and I’ve been list making some birthday resolutions. Giving my happy moments full attention is going to the top of the list! I’m bad about planning future trips too and not being present… though I also have found it helps on the drive home/first day back at work to know your next adventure isn’t too far around the bend. Great article and so true! One of the things I pride myself on is finding and experiencing happiness every day, but even so I catch myself planning the next trip, dinner, etc. while in the midst of the current one!